The BJP organised 'Mann ki Baat, Chai ke Saath', at all the 50,128 polling booths in 182 Assembly seats. AHMEDABAD: Seeking to counter a Congress' meme mocking Prime Minister Narendra Modi's 'chaiwala' past, BJP leaders, including Amit Shah and Arun Jaitley, today tuned in to his radio programme 'Mann ki Baat' while having tea with people across poll-bound Gujarat. BJP president Shah listened to the programme at a tea stall in the city's Muslim-dominated Dariyapur area in the presence of hundreds of locals and party workers. Union Finance Minister Arun Jaitley was present at a booth in Adajan area of Surat-West Assembly constituency, said a party release. Gujarat Chief Minister Vijay Rupani listened to Modi's monthly programme while having tea at Mora village in Panchmahal district, while Deputy Chief Minister Nitin Patel was present at a booth in his constituency in Mehsana. The other party leaders who joined the programme at various places included Union ministers Piyush Goyal, Dharmendra Pradhan, Uma Bharti, Smriti Irani, Jual Oram and Parshottam Rupala, Gujarat BJP president Jitu Vaghani and several state ministers, MLAs and some MPs. 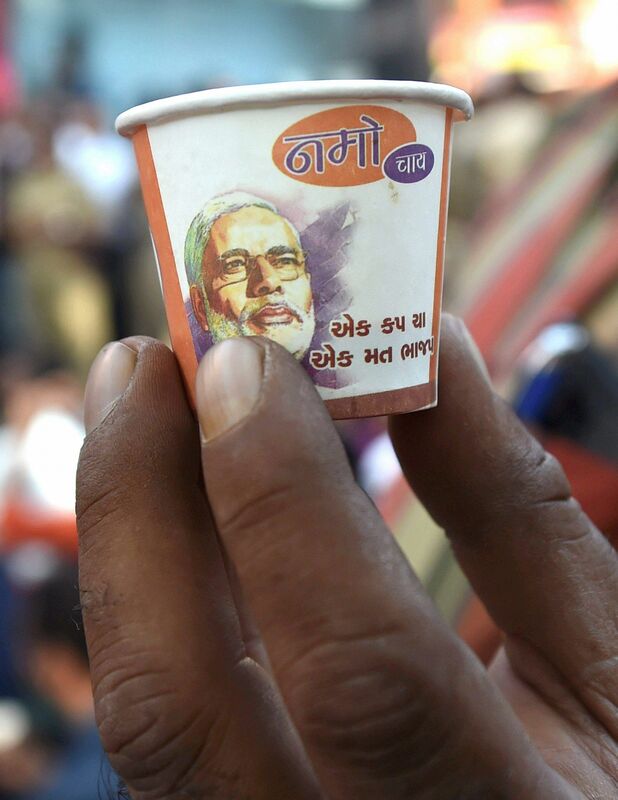 'Namo Chay' tea being served in Ahmedabad on Sunday. Irani, who was in Junagadh to take part in the party's event, told media persons that the people of Gujarat will "teach a stern lesson to Congress in this Assembly election for having an anti-poor and anti-Gujarat mindset." The event was organised ahead of Modi's tour of Gujarat on November 27 and 29 during which he will address eight rallies in Saurashtra and south Gujarat, where polling will be held on December 9. The official Twitter handle of the Youth Congress' online magazine "Yuva Desh" had last week kicked up a row by mocking Modi's "chaiwala" past and English speaking skills through a photograph. Soon after the controversy, the Youth Congress had tendered an apology and removed the controversial tweet. Chief minister Rupani had dubbed the tweet as "blatantly classist and anti-poor". Earlier, senior Congress leader Mani Shankar Aiyar had ahead of the 2014 Lok Sabha elections said Modi would never become the prime minister, and that if he wanted, the party can give him a place at its convention to sell tea. The BJP had leveraged the remark to launch its then prime ministerial candidate Modi's famous 'chai pe charcha' sessions, to connect with voters around the country.